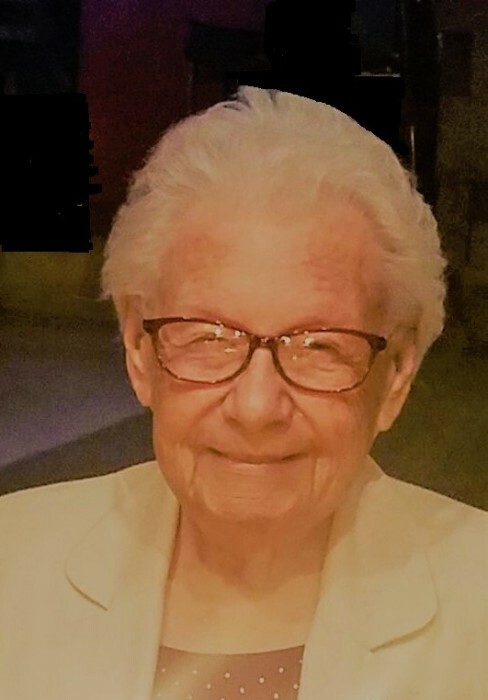 Obituary for Mary Elizabeth Taff | Smith Mortuary, Inc.
Mary Elizabeth Lenington Taff, age 93, went home to be with her Lord, her husband, many family members and friends on September 10, 2018. Mary was born to Lawrence and Pearl (Brisco) Lenington on March 23, 1925 at Cavanaugh near Fort Smith, AR, the first of seven children. As with most in her generation, Mary’s life was shaped by the realities of life in the 1930s and the war years of the 1940s. She shared warm memories of growing up in a family-owned dairy business. Her family moved numerous times throughout the Fort Smith/Van Buren/Barling, Arkansas areas during the Great Depression before settling on a farm along Highway 22 near Central City in the early 1940s. Though life was basic and possessions seemed scant, Mary’s memories of shared family and friend experiences were rich. On January 19, 1947, Mary married Verlon Taff, their earthly time together enduring until Verlon passed into eternity on September 19, 2002. The couple had three children and spent their early years together near Fort Chaffee, where Verlon was employed. When Fort Chaffee was deactivated in 1965 and Verlon transferred to Fort Knox, KY, the family moved to Valley Station in the Louisville area. Verlon retired in 1979; and Mary and Verlon returned to Arkansas, settling in the Booneville area. Mary stayed in that area until returning to Central City in 2007. At the time of her passing, Mary lived at Copperas Cove, TX near her daughter Barbara and family. Mary was a telephone operator/shift leader at Barling, AR until her first child was born. After becoming a full-time wife, mother and homemaker, Mary’s accomplished sewing skills kept her home decorated and her family clothed. She enjoyed gardening, bird watching, quilting, nature, and crafting in general; but by far, it was reading that fulfilled Mary’s life-long interest in learning and knowing what was going on around her and in the world. Her passion for the vital role that reading plays in learning was evident in the countless hours she devoted to growing and maintaining wonderful libraries at the Valley Station Baptist Church and the First Baptist Church of Booneville. Her dedication promoted literacy and the education, growth and spiritual development of the many who used these libraries. Another hallmark of Mary’s life was her unwavering, unnoticed support of Verlon’s daily, life-long ministry to others in service to the Lord . . . service that usually took priority of time and resources before leisurely pursuits or earthly possessions. In both her background and side-by-side support, she and Verlon partnered in loving others and walking with and serving God together. Mary is survived by her three children, Barbara (Don) McConnaughhay of Gatesville, TX; Carolyn (Kenn) Roehl of Rochester, MN; and Duane (Linda) Taff of Cedarville, AR; by brothers Edward Lenington and Billy Lenington of Central City, AR and Paul (Sharron) Lenington of McAlester, OK; and sister-in-laws Wanda Taff Graham, Pat (Scott) Taff, and Doris (Warren) Taff. Mary is also survived by 9 grandchildren, 24 great-grandchildren, 4 great-great grandchildren, and many nieces and nephews. Mary was preceded in death by her husband Verlon, parents Lawrence and Pearl (Brisco) Lenington, brother Robert Lenington, sisters Peggy Lenington and Sharon Lenington, her father- and mother-in-law William M. and Gertrude (Ashford) Taff, 8 brothers-in-law, 5 sisters-in-law, 1 niece and 4 nephews. A time of visitation will be 6:00 – 8:00 p.m., Friday, September 14, 2018 at Smith Mortuary, Charleston, AR. A funeral service is scheduled for 10 am Saturday, September 15, 2018 at First Southern Baptist Church, Central City, AR with burial beside her husband at the Oak Valley Cemetery south of Lavaca, AR. Memorials in honor of Mary’s memory may be made to the Pidcoke Baptist Church, Gatesville, TX 78628 or to Gideons International. Arrangements have been entrusted to Smith Mortuary of Charleston, AR.